Additional research provided by Whitmel M. Joyner, Paul E. Kuhl, and Jo Ann Williford. Union victories in the Eastern theater during 1861-62 were largely limited to coastal North Carolina, but these immediately illuminated the Union strategy of controlling the ports and thus limiting supplies to the southern interior. Hatteras fell in a Union amphibious invasion in the late summer of 1861, and on 8 Feb. 1862 Roanoke Island surrendered to Union troops under Gen. Ambrose Burnside. Soon Federal forces held New Bern, Morehead City, Beaufort, and Fort Macon and controlled much of eastern North Carolina. 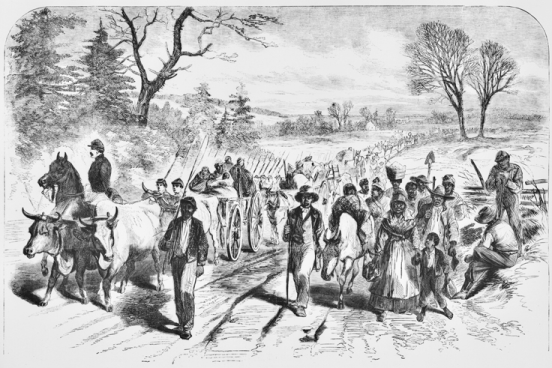 North Carolinians were appalled over these quick northern victories and furious with the Richmond government, which had left the state largely undefended. For a short time, Lincoln appointee Edward Stanly, headquartered in New Bern, served as military governor of North Carolina. Confederate political and military leaders hoped that newly constructed ironclad vessels would be the key in freeing eastern North Carolina. Although never tested in battle, the CSS Neuse was built to liberate New Bern and other coastal towns, while the CSS Albemarle played a significant role in the Battle of Plymouth (17-20 Apr. 1864). 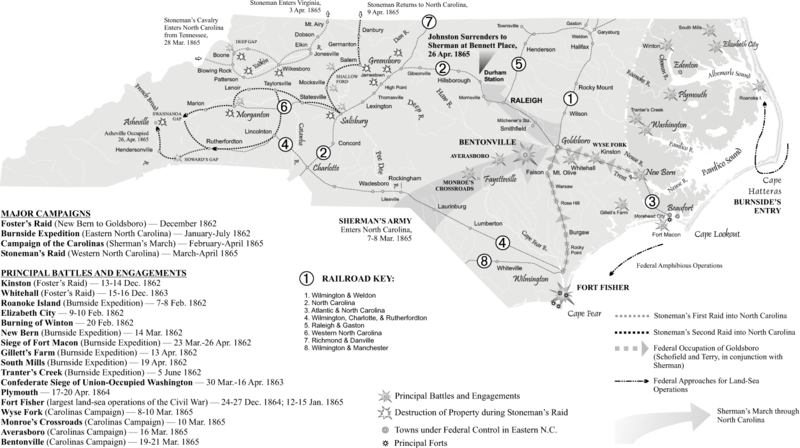 In January 1865 Federal forces captured Fort Fisher and a month later the port of Wilmington. Maj. Gen. William T. Sherman entered North Carolina from the south, and the Battle of Bentonville on 19-21 Mar. 1865 was the only major attempt after the Battle of Atlanta to defeat Sherman's army. Federal cavalry under Maj. Gen. George H. Stoneman in late March and April 1865 raided and destroyed property in North Carolina's mountain communities and in the western Piedmont. On 26 Apr. 1865, at the Bennett farmhouse near Durham, Gen. Joseph Johnston surrendered his army to Sherman-the largest Confederate troop surrender of the war. North Carolinians such as Daniel H. Hill, William Dorsey Pender, Stephen Dodson Ramseur, James J. Pettigrew, and Robert F. Hoke proved themselves to be among the most reliable Confederate generals, and Braxton Bragg was among the most controversial.